ATHOLIC MUSICIANS have a tough job, and the obstacles can sometimes seem insurmountable. I’ve come to believe that authentic sacred music will return to our churches only through the leadership of strong Catholic priests. However, many priests lack confidence in their liturgical knowledge, believing that only “experts” can comprehend the rubrics and terminology. To help remedy this situation, I present today an explanation of the Mass Propers. PLEASE NOTE : Priests who carefully listen to the following examples will end up learning a ton about Gregorian adaptations in the vernacular—in a very short time! 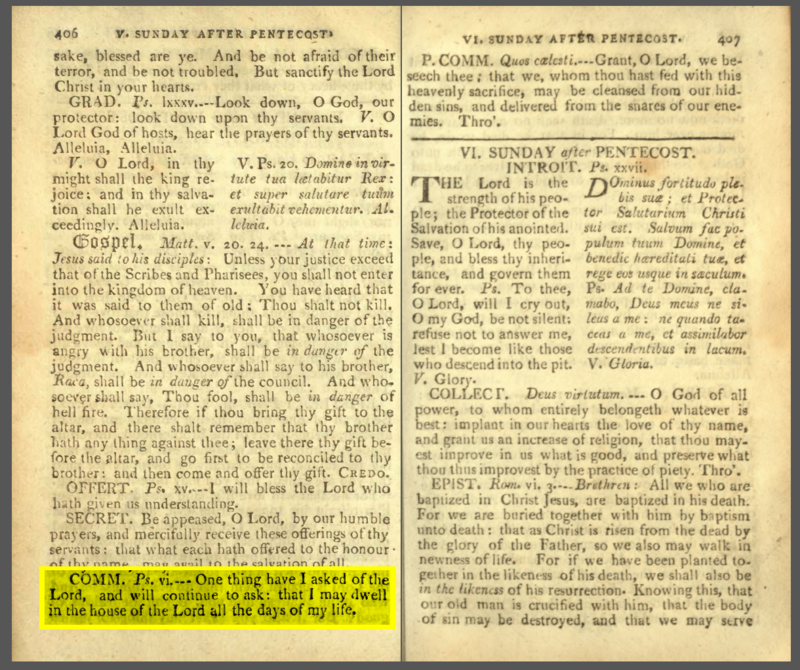 HE COMMUNION ANTIPHON for the 11th Sunday in Ordinary Time formerly was called “5th Sunday after Pentecost.” That’s because changes were made to the liturgical calendar after Vatican II, and the season after Pentecost was eliminated. The current liturgical books still reference the older title, believe it or not. HOPE THESE EXAMPLES have shown different ways vernacular propers might be implemented at your Catholic parish. I was not able to mention all the collections currently available, and will not here speak of the advantages of praying the Propers. Of the thirteen (13) complete collections above, eight (8) come exclusively from the Roman Gradual revised after Vatican II. As Fr. Anthony Ruff reminds us, the Missal texts are for “spoken Masses” while the Gradual texts are for “sung Masses.” Here are nine (9) reasons the sung propers are preëminent according to the Universal GIRM. By the time the people figured out which option was being sung, the Communion antiphon would be over! 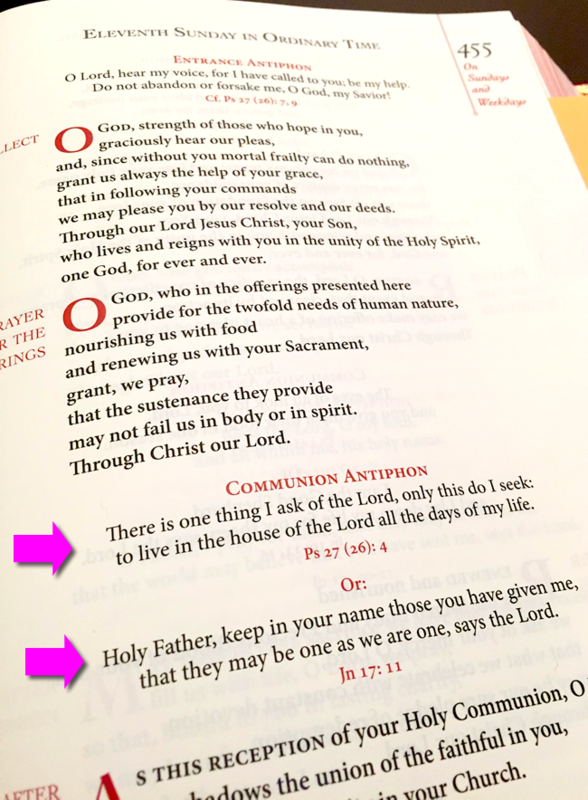 ERE’S THE GOOD NEWS: the “spoken vs. sung” issue doesn’t touch any of the Entrance or Offertory antiphons. It’s only the Communion antiphons which sometimes do not correspond. We’ve seen the myriad ways a choir can sing the Communion antiphon. Should we be discouraged by all these options? No! I support the choices made in the JOGUES PEW LECTIONARY. We chose only the sung antiphons—the ones that go back 1,500+ years. If you have the Jogues in your pews, you only need to worry about matching what the congregation has before them. Everyone will then be on the same page, no matter what melody is preferred. The best part is, the musician no longer has to select a bunch of songs each week to replace the Propers; the Church has already chosen the songs! And on occasions when the musician has a valid reason to replace the propers, it will be more meaningful. 1 Some claim that “spoken” translations should be inserted where possible to unify our Scripture translations, but a careful examination shows this view to be unsustainable. Indeed, our translations continue to change, and it was recently announced that the Revised Grail is going to be revised again—in spite of the fact that the “first revised” version hasn’t made it into lectionaries yet. Fr. Samuel Weber was criticized for mixing his own translations with those of MR3 in his new collection, but those who have carefully examined our liturgical translations realize we already have a hodgepodge. It is reprehensible that our Catholic parishes—after five decades of Mass in the vernacular—are still forced to pay numerous different companies which own the various Mass texts. Composers who choose spoken texts over the sung versions are frequently inconsistent. For example, the spoken propers give two options for the 11th Sunday in Ordinary Time, and the rubrics say neither one is to be preferred. The official Latin also displays both options. Yet, several collections which claim to favor the spoken texts ignore one (“Pater Sancte”) and set only the sung text (“Unam petii”). On other occasions—such as the 13th Sunday in Ordinary Time—these composers ignore one sung text (“Inclina aurem tuam”) as well as a spoken text (“Pater, pro eis rogo”) while arbitrarily choosing a different spoken text (“Benedic, anima mea”). Someone will probably exclaim, “But the American GIRM says we are free to set the spoken versions.” However, what we are allowed to do is not the same as what we should do. 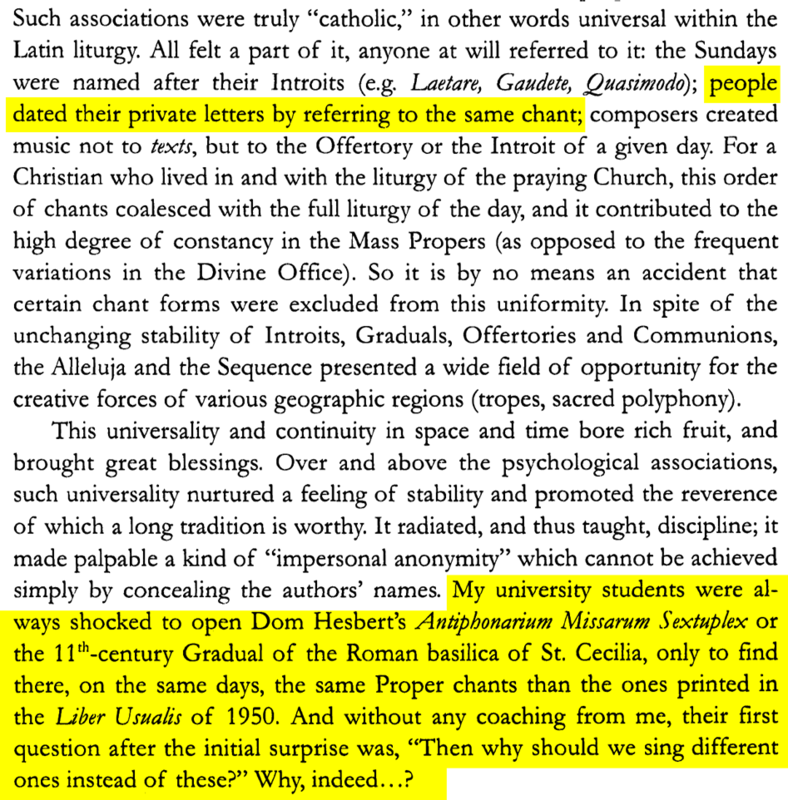 By the way, spoken propers are hardly ever recited at Sunday Masses; they’re usually replaced with a hymn or song. Therefore, eliminating the sung versions to match what the celebrant would recite (in Masses without music) makes no sense. 2 Some might ask why revisions were necessary for spoken Masses. Were the ancient propers somehow deficient? 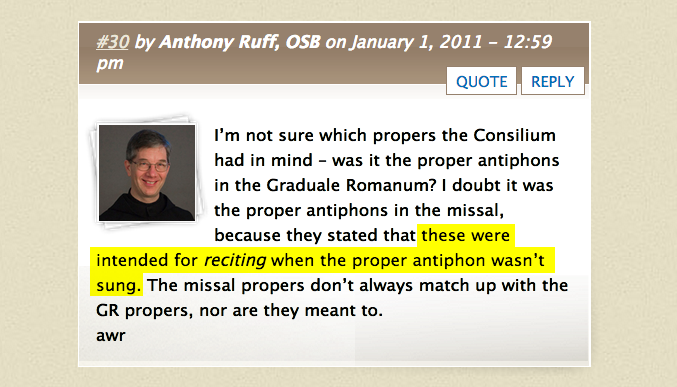 The answer seems to be that spoken antiphons were created to add variety to daily Masses, but things got out of hand. Some Communion antiphons for Sundays were tampered with in violation of what Vatican II decreed: “There must be no innovations unless the good of the Church genuinely and certainly requires them” (Sacrosanctum Concilium, §23).